MONTREAL - June 29th, 2015 - A coalition of farmers, food banks, health advocates and community food organizations is calling on candidates in the upcoming federal election to commit to ensuring no Canadian goes hungry as a part of a new national campaign launched today. And they are using food and community meals to get their message across. Food Secure Canada is spearheading the national coalition in an innovative campaign called Eat Think Vote that will see Canadians in over 100 federal ridings sitting down with their candidates to discuss Canada’s most urgent food-related issues while enjoying a meal together. “Food is a great conversation starter and having food at Eat Think Vote events takes the edge off a bit as well. The important thing is communities across the country will be coming together to tell federal candidates why we need fresh new thinking in Ottawa in order to create a healthy, sustainable food system that feeds all Canadians,” says Bronson. Eliminating hunger in Canada through a basic income, better support for new farmers, investing in a healthy school food program and addressing the absorbently high food prices that have triggered a crisis in the North will all be openly discussed at Eat Think Vote community meals. Food Secure Canada and its partners argue all four of these issues would be best addressed by implementing a national food policy that removes the financial obstacles to producing and obtaining healthy and sustainable food in Canada. “A national food policy for Canada is common sense. One in eight jobs in Canada are connected to food, and diet-related diseases have overwhelmed our healthcare system costing taxpayers billions of dollars. We need a more coordinated approach in dealing with this vital issue impacting Canadians on so many levels,” says Bronson. 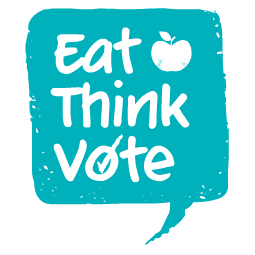 Eat Think Vote is a non-partisan campaign designed to engage federal candidates and Canadians on the far reaching benefits of Canada finally adopting a national food policy.